Coll. No. 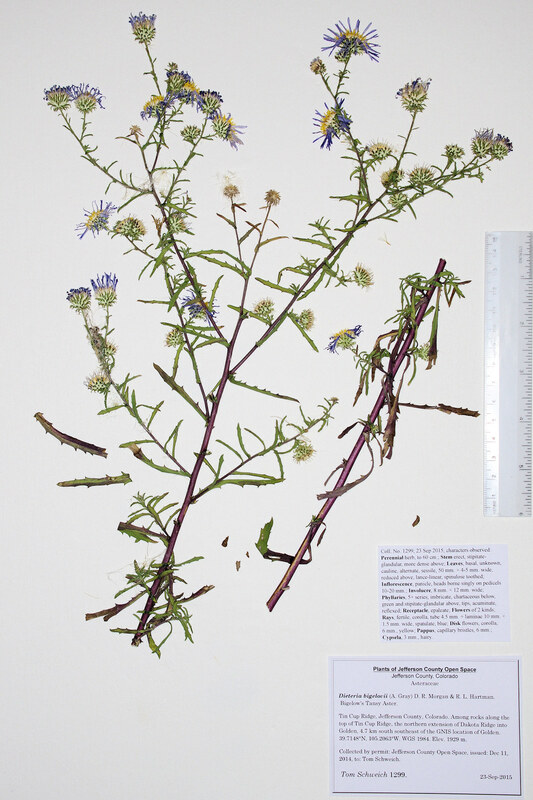 1299, 23 Sep 2015, characters observed: Perennial herb, to 60 cm. ; Stem erect, stipitate-glandular, more dense above; Leaves, basal, unknown, cauline, alternate, sessile, 50 mm. × 4-5 mm. wide, reduced above, lance-linear, spinulose toothed; Inflorescence, panicle, heads borne singly on pedicels 10-20 mm. ; Involucre, 8 mm. × 12 mm. wide; Phyllaries, 5+ series, imbricate, chartaceous below, green and stipitate-glandular above, tips, acuminate, reflexed; Receptacle, epaleate; Flowers of 2 kinds; Rays, fertile, corolla, tube 4.5 mm. + laminae 10 mm. × 1.5 mm. wide, spatulate, blue; Disk flowers, corolla, 6 mm., yellow; Pappus, capillary bristles, 6 mm. ; Cypsela, 3 mm., hairy. Field Notes: Coll. No. 1299, 23 Sep 2015. Other photos about Species - Asteraceae or Dieteria bigelovii.